Like Anna, I think I have a mulch obsession. I can’t get enough of the stuff! Last week we had a truckload of mulch delivered from the Dunmore waste depot. It cost about $115 to have them deliver 9 cubic metres (12 cubic yards, or 4.6 tons), which I think is money well spent. Apparently you can go and fill your trailer with the stuff for free, but look at my trailer compared to the pile. I think it would have taken at least 10-15 trips to drag home that much mulch, and I would have had to do all the shovelling myself! Can you see the steam rising out of the top of the pile? It’s partially composted, but still pretty hot. And here’s a close-up to give you an idea of the structure and composition of the mulch. It’s made up of all the municipal green waste, shredded and partially composted. There’s a good mix of fine compost and larger chunks in it. There’s also more plastic and bits of painted wood than I’d like, but not enough to be a big concern. I can pick most of it out as I use the mulch. So what am I going to do with all this mulch? I’ve been digging some new garden beds, and in between them I’ve dug deep paths on contour. The paths are about a foot deep, and I dug that soil onto the beds to make them a little higher. In the bottom of the trenches I’m laying down cardboard (to smother any kikuyu grass that tries to grow back), and then filling them with this mulch. Because the paths are on contour, they hold water when it rains and act like swales. The mulch soaks up the water and forms a reservoir, but because it’s loose and chunky the surface is still fine to walk on. The water will then be released to the surrounding garden beds slowly over the following week or two, reducing the need to water. As the plants in the beds get bigger, their roots will seek out the moisture in the paths and hopefully grow nice and deep and strong. Normally you’d shy away from putting so much woody matter on garden beds for fear of locking up nitrogen in the soil. But the paths are between the beds, so the soil in the beds will not be affected. In addition, mycelium (fungi) will colonise the mulch paths. Plant roots and soil microorganisms work together with the mycelium to feed each other, for the benefit of the growing plants. When the mulch in the paths eventually breaks down, it can be dug onto the garden beds as a rich humus dressing, and new mulch can be laid in the paths again. Rob over at One Straw has a great explanation of the concept, which he calls pit and mound gardening. It’s kind of like a mini swale/hugelkultur – garden paths don’t have to be unproductive! I’ll post some photos soon. Hopefully I’ll get to do some more work on the garden beds over the weekend. 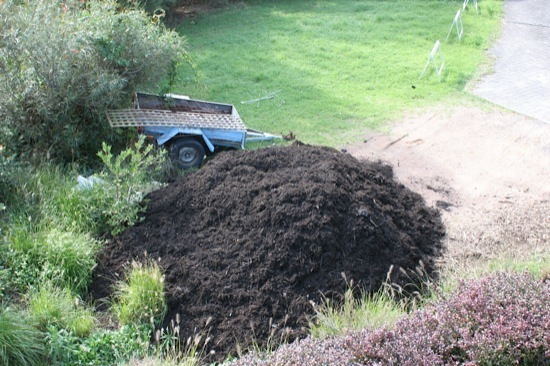 Hi Darren, I was told about this when I did the Bokashi course….I couldn’t believe it was free, if you shovelled it yourself…..so having seen this mulch…do you think you could grow veg directly in it…or does it need to compost down more….could you sieve it as you need it? I’m so desperate for good soil for my veg….. I too have cardboard down, preparing for a new garden bed….I was thinking of leaving it until winter has passed…then the grass would definitely be dead and gone….The cardboard has been down now for almost a month….Should I be building that bed now, of wait until it is spring I wonder. Anyway, great post…I love it when we can inform other locals to what is available. Well done! @NellyMary: Yep, free for the taking! 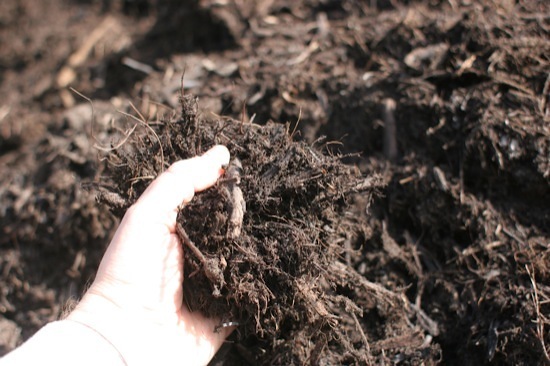 You couldn’t grow directly in it – it’s more of a partially-broken-down mulch than a compost. You could probable sieve it, adding the fines to your veggie garden and using the coarse stuff as mulch under fruit trees. If you did that, I’d make sure the veggie garden gets a dose of nitrogen as well, since the fines won’t be fully broken down and will rob the soil immediately around them of nitrogen. I saw that you had cardboard in the front yard. I’d probably wait until late winter before doing anything with those beds – not much will grow until then anyway, and the longer you leave the cardboard down the more likely the grass will be killed off fully. Or are you planning to build mounds/beds on top of the cardboard? You could start that now. I’m so jealous! If they would deliver that much mulch for that little money, I might get two or three loads. 🙂 I’ve been aching to do exactly what you’re doing, but mulching the beds themselves comes first and we’ve never had the extra time to hit the aisles. Someday…..
@Anna: I immediately thought of you as the truck tipped out the compost! This mulch is fairly coarse and woody – it’d be good under fruit trees, but not so great on a veggie garden. There are horse stables just up the road from me, and one day when I get a chance I’m going to introduce myself and see if I can come and get a few trailer loads of stable sweepings. 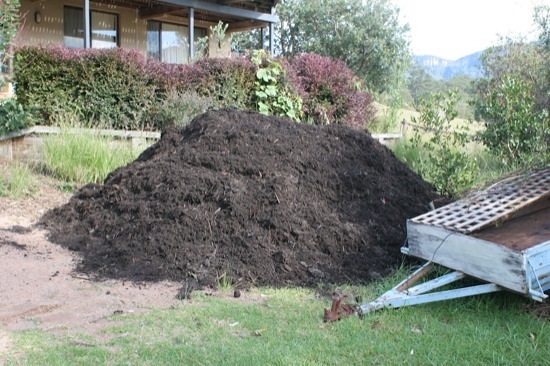 Then I can build some big compost piles, and get plenty of hay for mulching the gardens! I feel your pain! We are about 1/10th the way through moving 30m3 of mulch by shovel & wheelbarrow. Great exercise! We got ours free through the Aussie service Mulchnet, which pairs your request up to local tree loppers looking to dump their mulch nearby. We got 2 truckloads delivered for free. Pretty great! I’m converting about 40m2 of old lawn in a shady spot into a big garden bed using newspaper & cardboard topped with mulch – the tree overhead will take care of mulch “top-ups” for us after this. Hope it works as getting tired of battling Kikuyu..
@Avril: Wow, that’s a lot of work! I checked out Mulchnet – I’ll have to give it a go next time. Did your mulch contain much woody chips? Mine didn’t, and I’ve found it broke down faster than I’d have liked. Good if you’re composting it, but not great for making paths or if you want long-lasting mulch cover.